Home NewsOur apprentices: where are they now? Our apprentices: where are they now? James Fisher, age 30, is no stranger to workplace training. Having enrolled in a five-year apprenticeship in electrical engineering upon leaving school, he made the switch to fire protection six years ago; an interim measure made permanent by the fact that he enjoyed the industry. Today, he’s the Alarms Service Supervisor for Bay of Plenty at Argus Fire Protection. And, with the ink still drying on his National Certificate in Fire Detection and Alarms (Level 4), James is already lining up his next qualification from Competenz. His primary passion, electrical engineering, was rerouted following a stint in Australia working as a security technician. Upon returning to New Zealand in 2009, James’ prospects of employment in the post-GFC job market were scarce. So, he cast the net wider and took on a role in fire protection. “Most people think that fire protection is about smoke detectors and changing batteries, but it’s a highly skilled and technical industry. We work on everything, from small commercial and residential jobs, to large industrial projects,” says James. 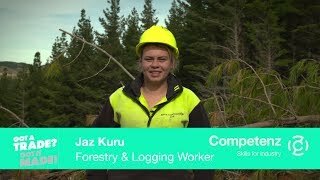 For James, a typical day on the job starts at 7.00am, organising the team’s work and making sure they have the tools to get it done. Then, he lends a hand with technical programming, as well as managing larger projects. James observes that most people in fire protection are technically minded. They’re also problem solvers, who enjoy variety. “I didn’t even think of going to university. I always knew that I wanted to get a trade. I like learning with my hands and making things work. I wanted to be out-and-about, not sitting in a classroom all day,” he says. Born and raised in Tauranga, he attended Mt Maunganui College before enrolling in a pre-trade course at Bay of Plenty Polytechnic. From there, he quickly catapulted from work experience to an apprenticeship with a local electrical company. Looking forward, James aims to grow as a supervisor and gain the skills to be the best he can be. That includes moving into more of a training role and becoming a manager – commissioning big fire protection systems and being involved in highly technical jobs.